Omar Nelson Bradley (1893-1981) was a military officer in the United States Army, serving as a top commander in North Africa, Italy, France and Germany in World War II under General Dwight D. Eisenhower. After the war Bradley headed the Veteran's Administration and served as the chairman of the Joint Chiefs of Staff (1949–53) during the Korean War. His great mistake was the failure to close the "Falaise Gap" in August, 1944. The 14th Infantry was stationed at Yuma, Arizona, when the United States formally entered World War I. Almost immediately, Bradley was promoted to captain as the Army began to mobilize. However, rather than moving to Europe, his regiment received orders to return to the Pacific Northwest, where it would police the copper mines in Montana. Throughout the next year, Bradley desperately tried to have himself assigned to a unit bound for the fighting in France, but to no avail. Bradley was promoted to major in August 1918, and shortly thereafter he received the much-desired orders to prepare for duty overseas. The 14th Infantry, with Bradley in command of its second battalion, became part of the new 19th Infantry Division, which was organizing at Camp Dodge, near Des Moines, Iowa. But the great influenza epidemic of 1918, coupled with the armistice in November, ensured that the division would never go overseas. With the war over, the Army rapidly demobilized and a frustrated Bradley never saw the battlefields of the Western Front. He was then posted to South Dakota State College, where he remained a year as an assistant professor of military science, reverting to his permanent grade of captain. Bradley graduated from the Army War College in 1934 and returned to West Point to serve in the Tactical Department. At Fort Benning he had taught and associated with men who would lead divisions and corps during World War II. At West Point he trained cadets - including William C. Westmoreland, Creighton W. Abrams, Jr., Bruce Palmer, Jr., John L. Throckmorton, and Andrew J. Goodpaster, Jr. - who would command battalions in that war and lead the Army in the decades of the 1960s and 1970s. Bradley was promoted to lieutenant colonel in 1936. When he left West Point in the summer of 1938 for duty on the War Department General Staff, he had spent some sixteen years in Army schools as student and teacher. After a brief period in the G-1, the Army staff's manpower and personnel office, Bradley became assistant secretary of the General Staff in the Office of the Army Chief of Staff. At times inundated by the flood of paper, he and Orlando Ward, later assisted by Bedell Smith, filtered the mass of information directed at the Chief of Staff, framing problem areas and recommending solutions. In February 1941, as the Army was expanding in anticipation of war with the Axis Powers, Marshall promoted Bradley from lieutenant colonel to brigadier general, skipping the rank of colonel, and sent him to Fort Benning to command the Infantry School. At Fort Benning Bradley supported the formation and training of tank forces, especially the new 2d Armored Division, then commanded by George S. Patton, Jr. He also promoted the growth and development of the new airborne forces, which would play a critical role in the coming war. His most important contribution to the Army, however, was the development of an officer candidate school (OCS) model that would serve as a prototype for similar schools across the Army. When war came, the OCS system would turn out the thousands of lieutenants needed to lead the platoons of an Army that eventually fielded eighty-nine divisions. The Infantry Officer Candidate School at Fort Benning alone would produce some 45,000 officers. When the United States formally entered World War II on 8 December 1941, Bradley, at Marshall's suggestion, was preparing a hand-picked successor to take command at Fort Benning. Marshall had bigger challenges in mind for Bradley as the Army prepared for combat. Among the first steps he took was the reassignment of junior officers who were over age and unable to cope with field conditions; roughly 20 percent of all National Guard first lieutenants in 1941 were forty or older. The more senior officers who lacked the knowledge or skills for battalion and regimental command also found themselves transferred. He also reassigned officers and sergeants within the division to eliminate the "home-townism" peculiar to 1930s National Guard units, a system that hampered proper discipline. But the worst problems of the 28th Division were not of its own making. The division had been repeatedly levied for officers and noncommissioned officers; over 1,600 had gone to OCS or aviation training since the division was mobilized. Bradley put a stop to this drain in manpower and obtained new drafts from OCS to replace the losses. He then began a systematic training program that included the intense physical conditioning he had found necessary in the 82d. He also led the division through increasingly more complex tactical exercises at the battalion and regimental level, culminating in amphibious assault training on the Florida coast. The stage was set for the final campaign of the war in Europe. Bradley planned to swing his Ninth Army south and First Army north in a double envelopment that would encircle the Ruhr and meet in the vicinity of Kassel. Once that was accomplished, he intended to detail some units to mop up the Ruhr and then attack with Ninth, First, and Third Armies from Kassel toward Leipzig and Dresden, halting at the Elbe River where American forces were to meet the Soviets. The operation developed very much as Bradley planned, with the pincers closing around the Ruhr on 1 April. By 12–13 April American units had reached the Elbe River. Bradley's troops had captured in excess of 315,000 prisoners, more than had been taken at Stalingrad or in Tunisia. In a final offensive Bradley sent Patton's Third Army to attack along the Danube into Bavaria, Austria, and Czechoslovakia, cementing the Allied success. Somewhat unwillingly, Bradley accepted the job and began to modernize and restructure that antiquated organization to meet the challenges that it would soon face. Before the end of the war the VA was responsible for some 5 million veterans, with a few pensions still going to cases arising from the War of 1812. By 1946 almost 17 million veterans were on its rolls. Bradley completely rebuilt the organization on a regional basis and insisted on basing his decisions on the needs of the veteran, rather than on the political considerations that had so often governed in the past in such matters as the location of VA hospitals. With the help of Maj. Gen. Paul R. Hawley, Eisenhower's theater surgeon, he completely overhauled a medical care system that Hawley had described as medieval. He also revised and extended the educational benefits of the G.I. Bill, arranged for jobs and job training programs for men whose only experience had been as members of the armed forces, established a program of loans for veterans, and administered a staggering growth in veterans insurance and disability pensions. Bradley was unable to accomplish everything he had hoped to do in his two-year tenure, but in the assessment of the press, he transformed "the medical service of the Veterans Administration from a national scandal to a model establishment." On 7 February 1948, Bradley succeeded Eisenhower as Army Chief of Staff and became immersed in a series of problems arising from demobilization of the Army, reform of its General Staff organization, and the unification of the armed services. In the international crises which followed-notably the hardening of relations with the Soviets-Bradley fought for both sufficient budgets and modernization investments to meet the requirements imposed by the Truman Doctrine and containment. The results were mixed. Congress rejected Army proposals for universal military training, and the idea of bringing the National Guard under direct Army control foundered on the shoals of political interest. Bradley did, however, gain presidential support to extend the Selective Service System, and in 1949 he managed to secure an increase in military pay that brought it into line with equivalent civilian pay scales for the first time since well before World War II. After eighteen months Bradley turned over the job of Army Chief of Staff to J. Lawton Collins to accept another appointment. On 16 August 1949, he became the first Chairman of the Joint Chiefs of Staff (JCS), and on 22 September 1950 the 81st Congress officially promoted him to General of the Army with five stars. He was the last officer in the American defense establishment to be promoted to that rank, and the only one since World War II. Bradley served two terms as Chairman of the Joint Chiefs. Those four years were exceptionally difficult ones. Major disagreements between the Navy and the Air Force over roles and missions had begun while Bradley was Army Chief of Staff and continued into his tour as JCS Chairman. When debates over nuclear deterrence and the value of conventional forces further exacerbated service differences, Bradley played an important role as a mediator. Internationally, he was involved in the creation of the North Atlantic Treaty Organization (NATO) and the rearming of western Europe. He became the first Chairman of the Military Committee of NATO on 5 October 1949, serving in that post through 1950 and remaining as the U.S. representative to the NATO Military Committee until August 1953. 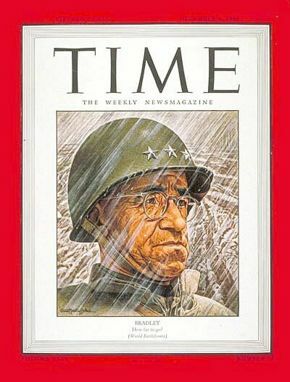 A constant adviser to President Truman through the Korean War, Bradley worked both to contain the conflict in Asia and to maintain a credible deterrent against the anticipated Soviet attack in Europe. Bradley, Omar N. and Blair, Clay. Title: A General's Life: An Autobiography. 1983. 752 pp. ↑ The Canadian forces were part of British General Sir Bernard L. Montgomery's 21 Army Group. At this point Montgomery was Bradley's superior.